I read an article today about movies with upcoming sequels that probably shouldn’t have sequels. The article itself was terrible — you know, just one of those articles with a bunch of single sentence paragraphs. Anyway, it referenced the movie Die Hard. I was unaware that another sequel was in the works (apparently one is with Bruce Willis on board) and, from a personal standpoint, they probably should have stopped making Die Hard movies half way through the second one. That’s about where I lost interest in John McClane. But the original from 1988 is one of those few movies that acts as an anchor when I’m channel surfing. I mean, there could be less than 10 minutes left until it’s over and I’ll still stop to watch. I was in 7th grade when Die Hard came out. I’m not certain if I was in the target demographic — probably not — but it certainly stuck with me. The movie came out 21 years before either of my kids were born. Applying that to myself, can I think of a movie my dad would watch over and over that came out 21 years before I was born? One that I also enjoyed? The first thing that comes to mind for me when I think of 1955 is, sadly, the first Back to the Future movie. Another of my favorites but not really applicable here since it came out in 1985. 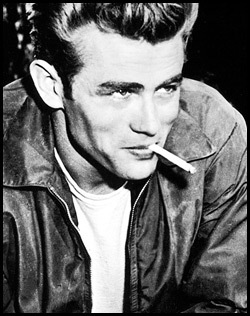 A quick google search reveals that Rebel without a Cause came out in 1955. I’ve certainly heard of the movie but I’m pretty sure I’ve never seen it. Don’t recall my dad ever watching it on the couch either. 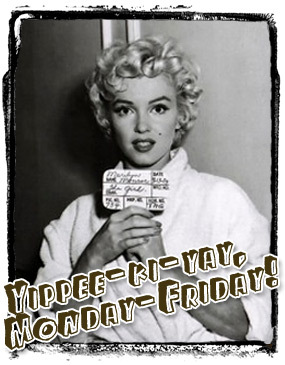 Marilyn Monroe’s Seven Year Itch came out in 1955 too. I had to watch that movie in high school (for reasons that I can’t recall) and thought it was fairly entertaining. Can I imagine my dad saying the same thing? The only old movies that I can think of that would instantaneously get my dad to stop surfing were Ben-Hur (1959), The Good, the Bad, and the Ugly (1966), and Planet of the Apes (1968). Ben-Hur is pretty close to 1955. That said, I thought it sucked — along with all of the ancient Greek and Roman clone movies that followed. I think my dad just enjoyed any movie that could boast a cast of thousands with a few chariots thrown in. It wasn’t until my late 20’s that I realized what a great movie The Good, the Bad, and the Ugly truly was even though Clint Eastwood is quite clearly one of the worst actors in history. I vividly remember in high school rolling my eyes each time I’d catch my dad watching it on a Sunday afternoon, like, every single Sunday afternoon. Seriously, to this day, I think that movie is on television at least once per week. At least. I catch pieces of it all the time. Still, though, I can’t claim to have enjoyed that one alongside my dad either. 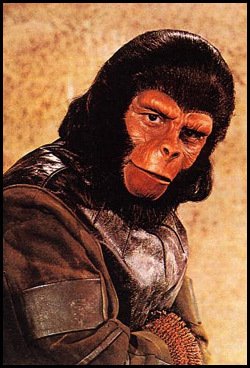 And who could forget the Planet of the Apes? I couldn’t stand Charlton Heston but I liked this movie and all of it’s sequels right up until Marky Mark and Helena Bonham-Carter ruined the entire franchise a few years back. Now these were movies that we’d watch together. While I remember the plotline of original the best, I think it was one of the goofy sequels (or the tv series?) where they’re in modern day San Francisco (or some other such place) that I remember most fondly. Sadly, outside of the original or the Marky Mark remake, you never see these on television. Eitherway, those movies (the sequels) are only a few years older than I am — not a couple of decades older. They don’t really apply. So, will my kids treat Die Hard (or Star Wars, or Back to the Future, or The Goonies, or Red Dawn, or Rocky IV, or Space Balls — all 20+ years old now) the same way I treated Ben-Hur? Here’s to hoping Angie is right! The Poseidon Adventure. The first one from 1972. Dad loved that movie too. Even though I can’t fathom it right now as I think all the movies you listed are classics, but I bet your kids (and mine) will not like them.